The Moravian Mission station was established in Makkovik in 1896 under Rev. Jannasch, who oversaw the construction of the first church and mission house. The White Elephant Building was constructed in 1915 as a boarding school under the direction of the missionary of the day, Rev. Lenz. It was built chiefly with the help of the gifts of local settlers. 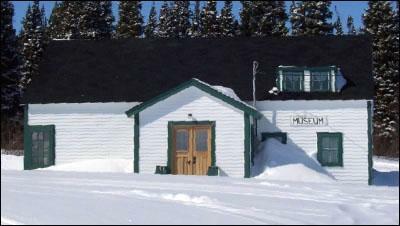 The White Elephant Building is one of few remaining examples of Moravian architecture on the north coast of Labrador. The building was used for many purposes over the years - boarding school, nursing home, then a boarding school again for a short time, and as a clinic. Since it was rarely used for its original purpose, but still required maintenance, the building was often referred to as the "White Elephant." The name has stuck. As the nursing home, it was used by midwives to deliver the babies of settler women from nearby fishing stations. Several local women were often called upon for this service. One, Susan Andersen (1914-2000) delivered 50 babies in her lifetime. The missionaries played the roles of ministers, traders, social workers, and medical personnel. Their only medical training was usually a nine-month course, but many settler families were grateful for the services provided by the mission. In the 1940s one of the missionaries attempted an emergency surgery. The operation failed and a teenage girl died. This could be the source of the rumour that the White Elephant is haunted. After Confederation in 1949, more families settled permanently in Makkovik. Prior to that, at festival times, Christmas and especially Easter (when travelling conditions were better), families travelled to Makkovik from outlying stations such as Ben's Cove, Seal Cove, Lance Ground, and Turnavik, to take part in church services and community events. They sometimes found lodging at the White Elephant. The White Elephant Building is simple in its decoration and design. Image © 2005 Shelley Clarke, Makkovik. In 1959, about 30 families were resettled in Makkovik from Hebron. The carpenters involved in the resettlement project were Newfoundlanders, brought in to build new houses. They lodged in the White Elephant. The same year, it also served as the residence for the first full-time nurse. She moved into the new clinic built by Grenfell Regional Health Services in 1961. Around 1964, a front extension was added by Rev. Siegfried Hettasch. The building around that time served as a teacher's residence, until a new teacher's home was constructed in 1971. In latter years, it was rented out to various tenants. In 1996 the community celebrated the 100th anniversary of the Moravian Church in Makkovik. 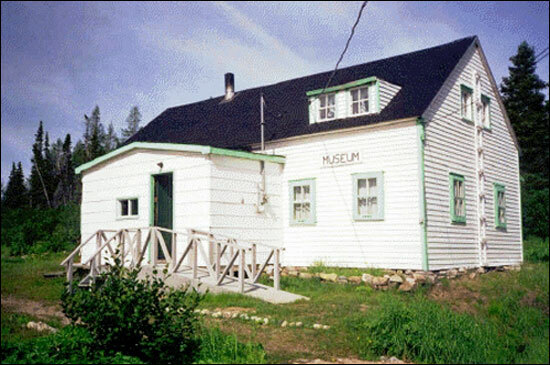 At that time, Gary Mitchell and the Centennial Committee decided to convert the White Elephant into a museum. With full community support, it became the perfect display location for family relics and antiques. Today it houses over 200 artifacts which have been donated or loaned by residents of the community. Items include fishing and hunting gear, old photos, kitchen utensils, tools, family Bibles, traditional clothing, mission diaries, a polar bear skin, and much more. In December 2000, the White Elephant was officially designated a Registered Heritage Structure by the Heritage Foundation of Newfoundland and Labrador. Also view White Elephant Building Registered Heritage Structure on the Heritage Foundation of Newfoundland and Labrador web site. The Newfoundland and Labrador Heritage Web Site has on its site only a portion of the registered heritage structures in Newfoundland and Labrador. To view a complete list or search for a particular structure visit the Heritage Foundation's Property Search page.